Recently, I received two non-fiction children’s books written by Leanne Matlow – a counselor and workshop facilitator based in Toronto. Her two books are: Thinking About Thoughts and Tell Me! 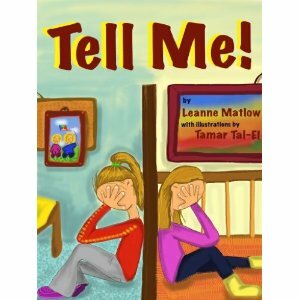 Tell Me!, illustrated by Tamar Tal-El, focuses on the worry, anxiety and concern that sometimes consumes children and teens. In this short colourful book, a pre-teen is worried about her twin sister, Kim. Kim is dealing with an anxiety disorder and the book cleverly and clearly illustrates how one family member’s health concerns can radiate out to affect family and friends. Kim’s sister is frustrated because although she can see that Kim is suffering and her personality has changed, no one explains what’s going on. She herself feels anxious and alone. After speaking with her parents, our protagonist understands that Kim is having a difficult time. She begins to see a “coach” named Dr. Simon who later explains to her whole family what’s happening with Kim and how they too can help her out. “Finally, the truth!” says our protagonist. 1) Do-It Guy who tells us it’s best not to avoid; just give it a try. 2) Distraction Dude helps us focus on something else instead of our anxious thoughts. 3) Whoa! Man reminds us how to stop unreal, unwanted or unhelpful thoughts. 4) The Reflector assists us by reminding us of our past successes. If your child is dealing with anxiety you may want to pick up Tell Me! and use it as a tool for meaningful discussion. Let me know if you do. Leanne Matlow is a Professional Colleague of the Academy of Cognitive Therapy and an Associate member of the Association for Behavior and Cognitive Therapies. Leanne’s blog for parents can be found at http://lmatlow.blogspot.ca.